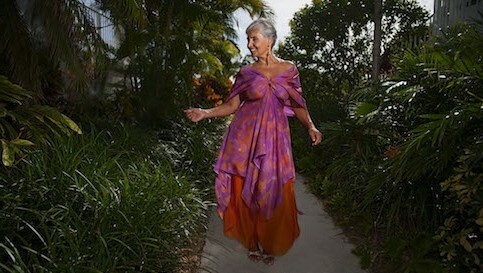 For the woman who loves to express her femininity in the islands, her tropical resort wear wardrobe most likely has more dresses than cut-offs. These pieces are almost always romantic dresses with a lot of romantic flow in their design. If you love to express your femininity with floaty dresses, and you’re looking to inject your unique signature style into your wardrobe, creating layered looks is an exciting way to mix and match your tropical resort wear pieces. Creating the perfect layered look can be tricky though, so the team at Jasmine Sky Designs will explain three pairing rules to help you navigate layered resort wear. If you’re partial to outfits with a lot of romantic flow, this rule will expose you to countless ultra feminine looks. Be wary though; Wearing a flowing, large volume garment as your top layer must be paired with a more fitted garment as your under layer. Similarly, if your are wearing large volume palazzo pants, they need to be paired with a more fitted top to keep you looking tropical chic. Come and explore these gorgeously relaxed elegant looks that show you how to balance volume when layering tropical resort wear. Try Christina or Dominica; two favorite Jasmine Sky Design originals with deliciously large volume dresses that actually have double full circle skirts with multiple neckline possibilities in the bodice. If you prefer a bandeau neckline with a full-bodied skirt, try Fiji, a Jasmine Sky Designs original created to inject subtle drama into your resort wear look. If you adore wearing reams of floating silks on your top half with a slim-fitted underskirt, Ariana is your dream beach wedding dress. Her full A-line skirt overlay creates a feminine silhouette that flutters in the warm island breeze, while the Mermaid Sarong acts as a slim-lined underskirt to add a touch of Grecian-inspired ethereal elegance. She can be worn free and floating, or cinched at the waist for an ultra feminine take on layered beach wedding dress looks. If high volume skirts and pants make you feel your most radiant, try Dominica; a Jasmine Sky Designs original you can wear as a flirty skirt or cinched-waisted dress with fluttering palazzo pants. If you love a halterneck look, try pairing the romantic Fiji dress with dazzling tropical palazzo pants for an iconic resort wear look. This is the perfect way to conceal your legs and add a hint of sensual tropical elegance while staying cool in the island heat. Classic style meets modern design in the Abaco Islands. This three-piece ensemble blends luscious silk pants, the Taveuni constructed sarong worn as an ultra stylish peplum, and the popular Moku Ola convertible top. By blending a cinched waist with a floating peplum and voluminous cropped pants, your lower half is modestly concealed while your top half is elegantly slim lined to create a perfectly balanced silhouette. To achieve a perfectly balanced silhouette, you need a perfectly-fitted, customized garment to help you feel your most radiant. By choosing a Jasmine Sky Design original, your tie-on garment is made to fit YOUR body to create a flattering, contrasting silhouette for your ultimate island getaway or beach wedding. Stay tuned for Pairing Rule #2!